Washington, D.C. — Today, TalkPoverty.org—a project of the Center for American Progress’s Half in Ten Education Fund—released a new interactive resource mapping state- and congressional district-level poverty data, based on new data released Thursday by the U.S. Census Bureau. Using seven key indicators—the total poverty rate; the women in poverty rate; the child poverty rate; and the poverty rate among African Americans, Asian Americans, Native Americans, and Latinos—the interactive offers an in-depth look at how poverty impacts various communities across the United States. 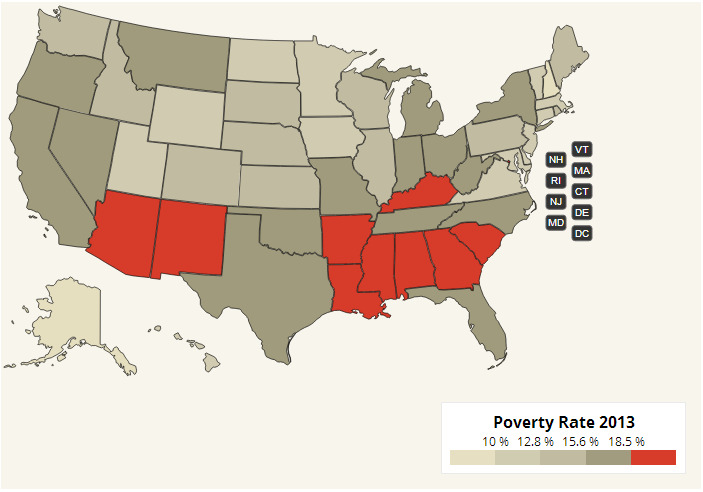 The new feature also includes a ranking of states’ total poverty rates and child poverty rates. Earlier this week, the Center for American Progress issued an analysis on the top 10 solutions policymakers can take to cut poverty, boost economic security, and expand the middle class. Among its recommendations, the analysis urges policymakers to raise the minimum wage; increase the Earned Income Tax Credit, or EITC, for childless workers; support equal pay; provide paid leave and paid sick days; invest in affordable, high-quality child care and early education; and expand Medicaid. TalkPoverty.org—a project of the Half in Ten Education Fund at the Center for American Progress—is an online hub dedicated to providing in-depth analysis and educational resources about poverty in America and what we can do at the local, state, and federal level to dramatically reduce it. Launched in May 2014, TalkPoverty.org is also home to a cutting-edge blog highlighting the vibrant voices of the anti-poverty community—people living in poverty and working to reduce poverty every day.